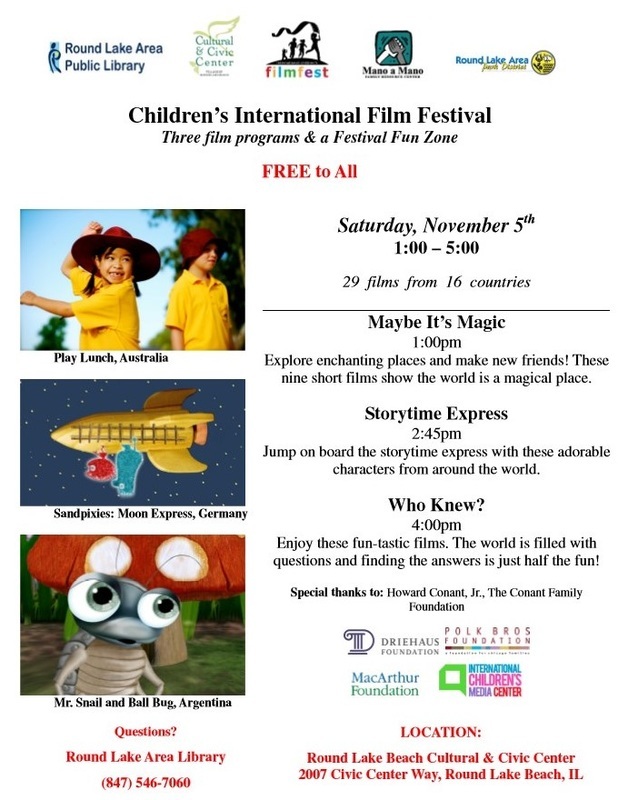 The International Children’s Media Center (ICMC), Round Lake Beach Cultural & Civic Center, Round Lake Area Library, Mano a Mano, and Round Lake Area Park District present the ICFilmFest, first touring festival of world class children’s films, at the Round Lake Beach Cultural & Civic Center. Three exciting screenings at 1:00pm, 2:45, and 4:00pm showcase 29 films from 16 countries. Children have the opportunity to vote for their favorite films immediately following each program. Their participation determines the winner of the “Best of the ICFilmFest” to be awarded to the film that receives the greatest number of votes. In addition to three screenings, the Round Lake Beach ICFilmFest will feature refreshments and a Festival Fun Zone with arts activities and information on upcoming Round Lake Community events. Mano a Mano Executive Director Megan McKenna comments on the interactive nature of the festival: "Watching movies needs to be a participatory experience for young children and their families. Lively discussions, activities and voting are designed to make the experience memorable and interactive for even the littlest cinephiles." The ICFilmFest is curated by Nicole Dreiske and presented by Round Lake Beach Cultural & Civic Center in collaboration with the International Children’s Media Center. Tickets for each screening are free. For more information call (847) 201-9032.